I do not like Imran Khan’s Pakistan Tehreek-e-Insaaf. I think the party has no clear policies, no agenda, and it is misleading the Pakistani youth. I believe that misleading youth could have catastrophic implications not just for Pakistan, but for PTI as well. Thankfully, most my countrymen agreed with me and did not give PTI clear cut majority in the general elections of 2013. PTI did win in Khyber Pakhtunkhwa, Pakistan’s North Western province. They formed a coalition government there with Jamaat-e-Islami. Since the very first day of elections, Imran Khan and his party PTI continuously protested the election rigging. According to the party, there was massive pre-poll rigging in selected constituencies throughout the country. Imran Khan said he has proofs, documented evidence, eyewitnesses, video clips and enough material to prove that elections were rigged in favor of Pakistan Muslim League Nawaz group. 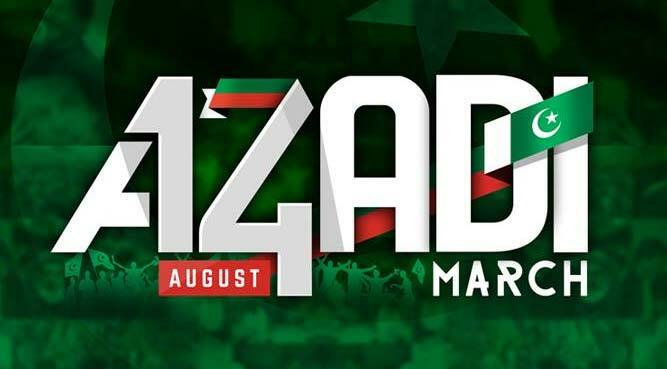 Pakistan Tehreek-e-Insaaf organized a country wide protest called Azadi March. PTI leaders including Imran Khan, camped outside Pakistan’s Parliament house for 126 days. During this sit-in, Imran Khan was alleged by a senior member of his own party, Mr. Javed Hashmi, as well as other political parties in Pakistan for collaborating with Pakistan’s military establishment to derail the government. Mr. Khan and Pakistan army both condemned and denied these allegations. PTI continued the protests and organized massive rallies not just in Islamabad, but also in all major cities of Pakistan. Government had support of all political parties and the parliament. All opposition parties gave Nawaz Sharif full support. This was a big blow for PTI as they had submitted their resignations to the speaker of the National Assembly. Technically speaking, many legal experts believe that those resignations are automatically accepted and all PTI’s MNAs are no longer MNAs. After months of tough negotiations, PTI agreed to hand over the matter to a judicial commission. The commission was tasked to listen to all the complaints of election rigging and present its report. Government agreed to organize re-election in the constituencies, if judicial commission found any evidence of rigging. The Judicial Commission presented its report concluding that there was no significant evidence of any mass rigging in elections. Prime Minister Nawaz Sharif addressed the nation and asked all parties to move forward. PTI has accepted the commission’s report. As for people questioning the report issued by Judicial Commission and its findings. The commission could only give recommendations based on the evidence, arguments, and documents presented to the commission from both sides. It seems like PTI was ill-prepared and had bad legal counsel. They were unable to prove any wrong doing. This is unbelievable, the general consensus is that all Pakistani elections are a mess of irregularities. Candidates often try to influence polling process using all legal and illegal means. There should have been enough evidence to prove that. I cannot understand why PTI failed to bring in that evidence to the commission. Now the Pakistani media, PML-N and PPP leaders are asking Imran Khan to apologize to the nation for wasting 126 days with his protest. Imran Khan and PTI refused to apologize. I totally agree, they should not apologize. It was good for democratic system of Pakistan. I didn’t like the way PTI formed alliances with the worst elements of Pakistani society during the protest. But I think that the protest will lead to good things. I hope PTI will continue to build pressure on government to bring forward a thorough electoral reform legislation. This legislation should be aimed at shutting down all the loopholes in our electoral system that allow non-democratic elements to interfere and even engineer the election results.